For such a tiny operation, Ally Hogan’s She Sells Seashells oyster enterprise does have big dreams: Bring delicious oysters to every inch of Ottawa; turn her part-time project into a full-time gig; make the world a tastier place. Hogan is on track, not yet a year into her operation, going at it deliberately: one oyster at a time. That’s all it takes, she says. Plus lots of ice. No stranger to the skills and lore of oyster shucking, Hogan came in second at the Chef’s Cup oyster shucking contest at the Bytowne Oyster Festival this summer on June 25. She grew up in Almonte, spent her formative years in Halifax, and worked with one of biggest names in the oyster game in Montreal for several years. It was there she discovered her passion for seashells. Last year, she connected with the good folks at the Whalesbone and began a mobile catering station. 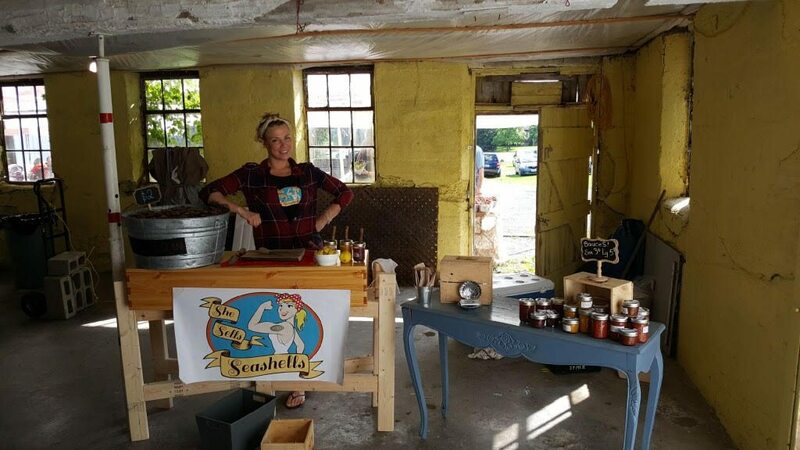 She Sells Seashells really took off in 2017 inside the barn at the North Gower Farmers’ Market. Every Saturday this spring and summer, Hogan has set up two tables—one for shucking and serving, the other for a display of homemade sauces. She Sells Seashells also caters to private parties at home or in venues, and this Saturday, from 2 to 8 p.m., Hogan will be slinging half shells at Rideau Pines Farm in North Gower at the sixth annual Arboretum Festival. We checked in to see how her one-woman operation began, how she plans to take over the world, and what it takes to love oysters. What’s it like serving up oysters at The North Gower Farmers’ Market? I love it! What I love most about the farmers’ market is that it’s a little community. Everyone has each other’s back, they all help each other out. I got the idea of doing it from my friend Sam Ravenda, who owns an incredible restaurant in Prince Edward County called Sand and Pearl. When she moved there from Toronto, she started her own oyster business called The Shore and started working at local wineries, farmers’ markets, and festivals. She said farmers’ markets are great for exposure, and they are! I think I hand out about 50 business cards a day. How long have you been shucking oysters? I’ve been working in it for about six years, but I’ve been shucking amateurishly since I was kid. I’ve always loved oysters. One day, I was bartending in Montreal, having a blast making drinks, talking to people and shucking. I realized if I could do anything for the rest of my life, it would be bartending and shucking oysters. So how did you get into selling oysters? I got my start in the oyster world in Montreal. I was blessed with the most amazing mentor, Daniel Notkin (owner of Notkins Oyster Bar). He’s well-known in the industry and an incredible shucker who started as a sushi chef. He taught me how to shuck, how to appreciate oysters, and much of the vocabulary around them. He taught me pretty much everything I needed to know. When I moved to Ottawa in 2016, Josh Bishop of The Whalesbone gave me a job. He’s probably one of most amazing human beings in the world. I worked in catering, the wholesale shop, and at the Elmdale Tavern. Because of that connection with Josh, I branched out. Where do you get your oysters, and are they sustainably-farmed? I either get them at Whalesbone or Lapointe. It depends on who is getting in the best product. Fun fact: all oysters are sustainably-farmed. Wild ones are very rare to come by, because unfortunately we’ve destroyed our oceans. Oysters are the canaries of the sea and really aren’t reproducing as quickly in the wild. What we’ve done to our oceans is just disgusting, it’s really heartbreaking. What’s this we hear about it being a bad oyster season? It wasn’t a bad season, but it’s been a little slow. There’s been unseasonably cold waters off the east coast, and that’s hard on crops. The buck-a-shuck trend happens everywhere but it’s really hard to get the right prices right now. It’s very rare that you’re going to find big ones at a good price point. Selling something that needs to be kept on ice seems like a huge undertaking for a farmer’s market. How do you do it? They stay in a fridge until it’s time to go. When we get there, they are kept on ice the whole time. Luckily the farmer’s market only goes from 8:30 until 1. But my cooler is just jacked full of ice, always. If you know what you’re doing and know how to handle it properly, you can do events almost anywhere. What do you teach as oyster etiquette? A lot of people don’t know how to eat an oyster, they’ve never done it. And to take what we call someone’s “oyster virginity” is a very delicate process. They are slimy things inside a rock! But there is a proper way to shuck, eat, and appreciate one. Some people say they love oysters and just cover them in sauce… I make sauces because people like them, but I’m a purist. If I put anything it’s a little drop of hot sauce. I wish! That’s the dream, but right now I’m also the floor manager at The Savoy to help supplement my income. Unfortunately, I’m not quite there yet. But soon. I’ll take over the world one oyster at a time, you’ll see! What kind of sauces do you make for your events and market appearances? Right now, I’ve taken a bunch of veggies from the Rideau Pines Farm to make a hot sauce and a mignonette, a classic oyster sauce. That I’ve made with cucumbers, green onions, white wine vinegar and an Ontario Riesling. The little sweetness at the end is great. The other is Peruvian style hot sauce with habanero, cilantro, garlic scapes, onions, tomatoes, cider vinegar, salt and pepper. It’s fun! I also have a butternut squash scotch bonnet hot sauce. Did you think that the city needed another oyster supplier? No, I just wanted to do it. It’s something I’ve always wanted to do. Josh from the Whalesbone knows I’m doing it, and he says, “we have a little competition out there now, good.” And you know if there are events that they can’t find the time to do, or are just too small for them, they send them to me. As long as I’m not stepping on their toes and they’re not stepping on my mine, it’s fine. Maybe Ottawa does need another one? I figure, why not?